Grenoble-based researcher Amélie Heliou knows a thing or two about game theory. A lifelong learner, she’s researched topics ranging from Bioinformatics to graph theory, and with research, has also traveled the world. She’s not stopping there. Since joining the Criteo AI Lab research team in Grenoble, she’s only just getting started on helping Criteo dive deeper into incrementality. This week we chat with Amélie on her academic background, incrementality, and why she joined Criteo AI Lab. I’m from France and grew up in Paris. I graduated from Polytechnique (French engineer school), majoring in Bioinformatics. I then furthered my studies with a PhD at Université Paris Saclay in Bioinformatics. My PhD gave me the opportunity to travel a lot and to meet other researchers. I did a post-doc at the LIG (Grenoble Computer Sciences Laboratory) on game theory. What got you interested in it and in this particular field of research? During my last year at Polytechnique I did a research master in Bioinformatics, so doing a PhD and starting a career in research was the natural thing to do. I chose a research master and not a professional master because I still wanted to learn and I wasn’t sure what I wanted to do beyond that. I choose Bioinformatics because since high school, I’ve always been interested in biology and wanted to work on molecules and drugs. My interest in Computer Sciences came later; I discovered it at Polytechnique, and found it so powerful that I wanted to work on it. My PhD was based on the study of molecules’ 3D shape, by the mean of graph theory and game theory. Although I still think that Bioinformatics is a fascinating topic, I moved to a more theoretical field after my PhD. My post-doc was on game theory applied to networks. I loved my daily work in post-doc, but felt I needed my work to serve a bigger goal. More than study the beauty of theoretical proofs, I wanted to be part of a bigger project. Therefore, I started to look at corporations doing interesting work, so that my work could be guided by the company’s aims. Criteo seemed prefect. My background in mathematics and game theory partially fit the machine learning topic and I wanted to be surrounded by machine learning experts to get more insights into machine learning and deep learning. Also, one thing that was important to me is that research work can be tested on A/B test (on the population). So, at Criteo a researcher works not only on publications but also on improving performance. Some of our readers might not know what a researcher does – can you give us a little background? First, we keep learning every day by reading papers, following classes. Criteo encourages their researchers to learn on Massive Open Online Courses (MOOCs), and attend workshops and conferences, all of which are crucial to keeping on eye on what’s new in our field. Second, we try to formulate a question or a need, to which we can provide an answer. Finally, we try to answer it, either by designing experiments or working on algorithms and proofs. At Criteo, the process pushes us to write down and discuss with others which questions we try to answer and how. It really is a team effort and I find it stimulating and reassuring that I won’t get lost working alone on a difficult problem. Research has taken you all over: Russia, Hong Kong, Palo Alto…what made you join Criteo AI Lab in Grenoble? I had the chance to travel a lot during my PhD and I loved it. Traveling for a few months, meeting and working with people from different continents is very enriching. However, I’ve always wanted to stay in Europe. I used to live near Paris, but when I arrived in Grenoble for my post-doc, I immediately loved it. Paris is a beautiful city, but it is full of drawbacks such as long commutes or expensive rents. To me, my quality of life in Grenoble is much better. I can go to work by bike or tram (no more traffic-jams or RER delays), and there are plenty of outdoor activities that I can get to without a car. So, when I decided to apply for jobs, I looked first in Grenoble. I wanted to join Criteo AI Lab because I wanted to work as a researcher while expanding my machine learning knowledge. Criteo AI Lab is full of machine learning expert researchers, so it was the perfect place for me. We have a little over 20 people in Grenoble, mostly engineers but also a small research team. The size of the team is not a limitation as we can easily travel en masse to Paris if needed. The rest of the time, we communicate with the rest of the Criteo AI Lab by video. I like it this way: working in a quiet and calm office every day and going to Paris once in a while. What have you been working on since starting at Criteo? 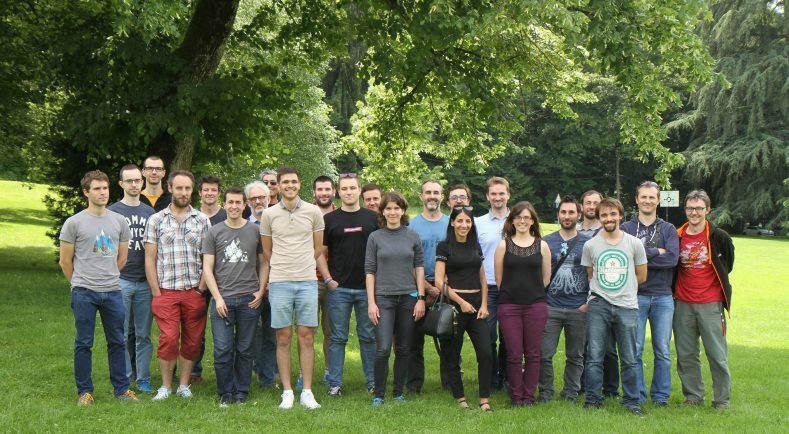 Amelie, center in grey sweater, with the Criteo AI Lab research team in Grenoble, France. I’m working on incrementality with the rest of the research team in Grenoble. I was new to it, but I find it very interesting. We first try to determine how an ad would affect the probability of a user performing an action on it, like clicking or visiting the website, or buying something. Incrementality focuses on the increase of this probability rather than the value. For example, we prefer to bid high for an ad that should increase the probability of user action from 0.4 to 0.6 rather than for an ad that would increase the probability from 0.8 to 0.85. We prefer the larger increase of 0.2 rather than the high value of 0.85. Normally, an advertiser would display an ad that could result in as high a probability as possible to incur a user action. But with incrementality we want to show that we can instead focus on having a big increase of probability. This should lead to displaying more ads that will attract the user’s attention, rather than display ads for products that users are going to buy anyway. Something people wouldn’t expect about research at Criteo? What most surprised me when starting was the emphasis Criteo places on training. The first month at Criteo starts with the on-boarding process with tons of training both online and offline with small groups of new hires to get us familiar with the Criteo Engine, products, and teams. I find it great, because I immediately felt that I was part of this big Criteo family. The training was especially helpful on the topics I was not an expert on. There are plenty of hobbies to embrace in Grenoble, mostly outdoor activities such as running, biking, climbing, and skiing, to name a few. I love running, mainly on track and road, but I’ve really come to appreciate all the trails Grenoble has as well. There are also many bike routes all around that I love. And recently, I started theatre acting in Grenoble. Cultural activities in Grenoble are not as plentiful as in Paris, but there are enough and they’re easily accessible, as in Grenoble everything is close. Lastly, any advice for aspiring researchers in your field? If you are already a researcher on a machine learning topic, be fearless and apply to Criteo! We’re looking for people like you. If you don’t work on machine learning then you should get familiar with this topic, and in particular with neural networks. There are plenty of books and classes to help you do that. Thank you so much Amélie! Interested in joining Criteo AI Lab? Learn more here! And check out everything Criteo culture here!